This easy to program timer provides up to 40 ON/OFF operations per week which can be used for 24-hour or 7-day load control. The astronomic feature provides sunset ON and sunrise OFF settings and the auto daylight savings adjustment means you can “set-it and forget-it”. The independent 7-day programming provides complete flexibility for applications where load switching differs each day of the week. Astronomic programming can be combined with independent programs to provide a sunset ON and timed OFF program. A factory supplied CR2 lithium battery provides up to three years of time keeping without AC power and user program selections are stored in non-volatile memory. A low battery indicator appears in the display when the battery requires replacement. In addition, the display continuously shows time of day, day of the week, timer load and the load status. 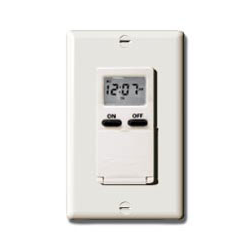 The timer has an isolated single pole single throw switch which allows the timer to switch any load type, including PAR lamps and motor loads from 12 to 277 volts AC or 12 to 28 volts DC, within the specified ratings. 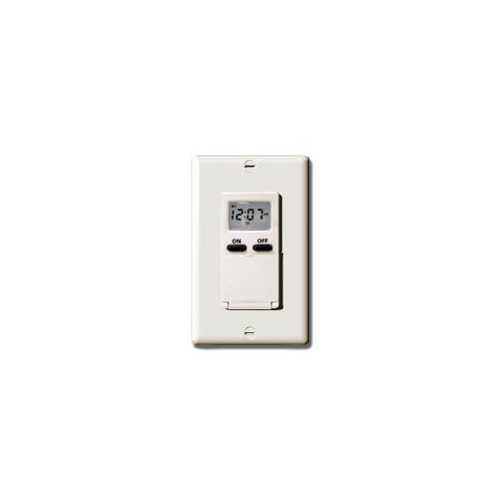 A “3 wire” design allows the timer to replace, or be used as a single-pole or 3-way (multi-way) switch.